The Escapists is a sandbox game forged by the Dark Souls generation. It’s punishing, minimalist, and occasionally obtuse, but in its difficulty, it manages to create a series of puzzles memorable enough to keep you coming back. The simplicity of the game’s core conceit - how to escape from a series of increasingly secure prisons? - belies a complex series of social and economic systems that you must adhere to while crafting your escape. If you upset the balance of the prison, which you almost assuredly will, the game can devolve into chaos and improvisation at a moment’s notice. It’s both frustrating and thrilling in a way that evokes some of the best prison escape stories, and The Escapists never fails to teach you that even the best laid plans often go awry. The Escapists begins with a short tutorial teaching you the game’s basic mechanics, like how to escape your cell through the air ducts. This simplistic scenario makes it seem easy to escape, given that most players should be out of the introductory prison within a minute or so. But the reality of the situation is anything but. The real prisons are highly complex and operate on a rigid schedule, and you’ll find that in practice the tutorial hardly prepares you for anything. You’ll have to bang your head against a lot of the game’s concepts before they start to make much sense. For example, I began my first escape by attempting to whittle down my cell’s air duct entryway with simple tools. The air duct’s durability is represented by a life bar, and once it depletes, I could slip away inside and crawl to other sections of the prison. However, tools have low durability, and each time mine broke, the air duct’s life bar would reset, an issue that didn’t present itself in the tutorial. Thus, I had to go about either crafting a new plan or collecting better tools. You’ll find that just about every plan you come up with manages to ruin itself in some unexpected way, either through your items not behaving as you expect them to, or through the AI systems clashing with your schemes. The short tutorial will end up feeling like a tease compared to the difficulty of actually escaping from any of the game’s multiple prisons, and it’ll probably take you hours of retrying to figure out how all of the game’s systems mesh together in a way that’s actually conducive to your escape. As you plot and scheme in your cell, you’ll have to contend with two primary systems that make up the core of the gameplay. The first is the AI routines, which dictate a number of sandbox-style events that can occur in the prison. Life in jail is highly structured, and if you break that structure, expect to find yourself punished by the guards. Every morning, each prisoner must line up in the courtyard for a check-in. If anyone is found missing, an alert will be sounded. You’ll typically have a bit of free time after check-in, but you’ll soon be required to head into the dining hall for lunch. Cell checks, recess time, and more are often built into the schedule as well, and typically all demand your presence so as not to arouse suspicion. The game then becomes an attempt to weasel what little progress you can manage in between mandated events like lunch and daily check-ins. In addition to this overarching AI, there’s a series of complex prisoner and guard behaviors at work that dictate how your fellow prison inhabitants respond to you. While the scheduling can feel restrictive and frustrating at times, it’s these smaller AI interactions that make The Escapists as fun, funny, and charming as it can often be. Other inmates will have missions for you ranging from starting riots to collecting certain items. Some of these missions will lead you into direct conflict with other prisoners, and when you slight one prisoner or help another, they’ll remember that for the rest of the session. Attack a fellow inmate, for example, and he’ll lash out at you anytime he sees you. I had one instance early on where I obtained a mission to collect chocolate for a prisoner named Bob, and another mission to start a riot in the lunch hall. In the process of starting the riot, I accidentally nailed Bob in the head with my makeshift cudgel, a bar of soap dangling in an old rag. From that point on, Bob would attack me on sight, even when I tried to give him his chocolate, effectively locking me out of that mission. Guards will also remember your crimes, and will respond with a series of increasingly harsh punishments. You can be thrown into isolation, which causes time to pass and could potentially ruin an escape plan, or you can even be shot dead, forcing a restart. The Escapists’ unique brand of punishment come quickly and oftentimes without warning. You’ll have to juggle the prison economy with its AI systems. Items don’t come for free unless you loot them from someone’s unconscious body, an action which comes with its own set of punishments. However, it can also be difficult to obtain barterable goods in prison, and getting items through completing missions will often result in you peeving off one or another of your fellow prisoners. The game’s structure can feel rigid at times, requiring that you attend certain events every day at certain times, and the game isn’t great at explaining its core concepts to you. Your first few attempts at escape will likely be a flailing mess. However, through its strange systems there shines a potential in The Escapists for you to craft your own unique stories, like the time I started a riot in the showers, or the time that Bob mercilessly hunted me down and thwarted my every escape attempt. In this way, The Escapists stands alongside the best sandbox games in that it encourages you to create your own stories, and share them amongst your friends. If you’re the type of person who enjoys working to exploit the confines of a restrictive system, you’ll love The Escapists. I also have to give The Escapists props for its unique conceit and its unflinching execution of its premise. There’s nothing quite like this out there, a massive puzzle set within the confines of a large-scale social and economic simulation. It’s a unique blend of puzzle, action, and improvisation that makes it hard to put down at times. And even when things get frustrating, I have to admire the developers’ dedication to their own set of rules. As annoying as some of the mechanics can sometimes be, it never feels like The Escapists breaks its own rules, and that goes a long way towards keeping things fair, fresh, and fun. 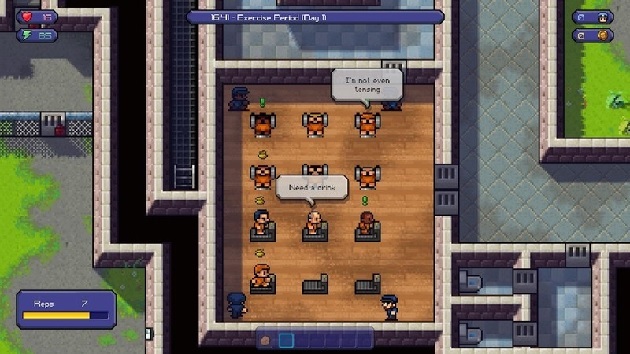 The Escapists 2, developed and published by Team17, offers the ability for players to orchestrate their own fantastical escape plans. Rooted firmly in the realm of fiction (because let's face it, no sane person would actually dream of going to prison), The Escapists 2 provides a novel and surprisingly cathartic "prison-simulation" experience. Superhot's time manipulation is a fun mechanic that allows you to play a first person shooter in a way you couldn't elsewhere. Despite a few shortcomings, the game does a superb job of mixing the first person shooter genre and puzzle games into entertaining experience. Toss your clothes into the bin and throw on that orange jumpsuit, you have just been assigned to The Escapist: Alcatraz. Escape if you can! Beautiful as Evolve is, looks alone can’t make a game.